I guess by now we should be accustomed to politicians lying to us. For years, Republicans have been promising to repeal Obamacare if we would just give them control of the White House, the Senate and the House of Representatives. We did that, and now they are breaking that promise. Because even if “Obamacare 2.0” miraculously gets through the Senate, most of the essential elements of Obamacare will survive. If you look at the latest Senate bill, most of the Obamacare subsidies are still in there, many of the Obamacare taxes are still in there, and most of the Obamacare regulations are still in there. On top of everything else, the bill would create an absolutely massive health insurance company bailout superfund, and that is something that the Democrats never even dared to do. The bill being pushed by Senate Majority Leader Mitch McConnell wouldn’t actually fix much of anything, and it certainly cannot be called a “repeal” of Obamacare. I have said this before, and I will say it again. The Republicans got a bill to repeal Obamacare through Congress and on to Barack Obama’s desk in early 2016. Obama vetoed that bill, but now the Republicans should take that exact same bill and get it to Donald Trump’s desk. Of course repealing Obamacare won’t fix our deeply broken health care system. But it would be a giant step in the right direction. So why won’t the Republican do it? Instead, they are trying to “fix” Obamacare, and that is about as futile as trying to “fix” a steaming pile of garbage. The Senate Obamacare bill does not repeal Obamacare. Not even close. In fact, the Senate GOP bill codifies and likely expands many aspects of Obamacare. The Senate Obamacare-lite bill codifies a federal entitlement to insurance. With the Senate GOP bill, Republicans, for the first time, will signal that they favor a key aspect of Obamacare – federal taxpayer funding of private insurance purchases. The bill will transfer billions of dollars to people who will then transfer billions of dollars to insurance companies. What a great business model – encourage the federal government to use taxpayer money to buy a private company’s product. Great business model, that is, if you are Big Insurance. Remarkable. The Senate Obamacare-lite bill does what the Democrats forgot to do – appropriate billions for Obamacare’s cost-sharing reductions, aka subsidies. Really? Republicans are going to fund Obamacare subsidies that the Democrats forgot to fund? This version is almost certainly destined to fail as well, because Rand Paul and Susan Collins have already come out against it, and McConnell can only afford to lose one more vote. If a Republican bill cannot get through the Senate, McConnell is already talking about a bipartisan effort that would involve cooperation with the Democrats. And of course the Democrats will want to keep as much of Obamacare as they possibly can. 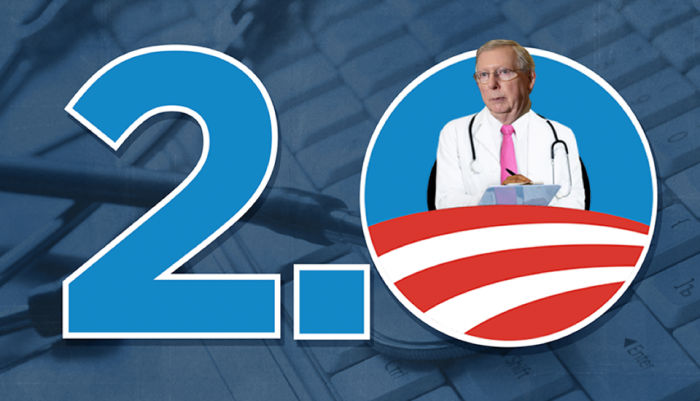 So at the end of the day it looks like we are going to end up with either “Obamacare”, “Obamacare 2.0” or “a new and improved version of Obamacare”. Did we really spend all of that time, effort and energy getting Republicans elected for this? Time after time these professional politicians use labels such as “Republican”, “conservative” and “Pro-Life” to get elected, but then once they get into office they betray our values over and over again. When are we going to start electing real conservatives instead of placeholders? When the Democrats get power, they aggressively move their agenda forward, but when Republicans get power nothing too significant ever seems to change. If I get the chance to go to Washington, I plan to be a wrecking ball. Party leaders like Mitch McConnell won’t like that very much, but if we can get enough good people elected in 2018 the Republicans will have entirely new leadership soon enough. Health care is an issue that deeply affects all of us. So many middle class families have seen their health insurance premiums go up by hundreds of dollars a month, and that can be absolutely crippling for a family budget. At one point a health insurance company tried to double what I was paying per month, and so I can definitely relate to what so many others are going through. We have got to dramatically lower health care costs. That means that we need substantial legal reform so that the cost of malpractice insurance goes way down, we need to remove as many “paper pushers” from the system as possible, and we need to restore as much competition to the system on every level as possible. The health care system should be built around doctors and patients. There is way, way too much bureaucracy in the system right now, and lots of people that are never directly involved in providing health care are becoming exceedingly wealthy as a result. Ronald Reagan once famously said that “government is the problem”, and this is another case where that phrase rings so true. If you take the shackles off, the free market system actually works extremely well, but these days both parties seem to want to constantly drag us toward socialism. If we do nothing, they will win, and that is why we need to stand up and fight for what we believe while we still can.